This cosy and comfortable beach house is an ideal getaway for a relaxing family holiday. 3 bedrooms, 2 bathrooms, two living areas, one wih TV, DVD and VCR. Rumpus room with table tennis table. Cosy wood heater. Neat garden with bbq and outdoor furniture. Just 2 minutes walk from a spectacular ocean beach and one block from a vibrant shopping centre full of street cafes, restaurants and fine gift shops. Spacious house near the beach! We were 4 adults, a toddler and a baby and appreciated the size of the house. Enough room for everyone with a lovely sun deck for family meals. The beach is within 5 minute walking distance. The house can be a bit cold if there is no sun but the fire place provides a cosy atmosphere on cooler days and in the evening. Communication with the host was easy. 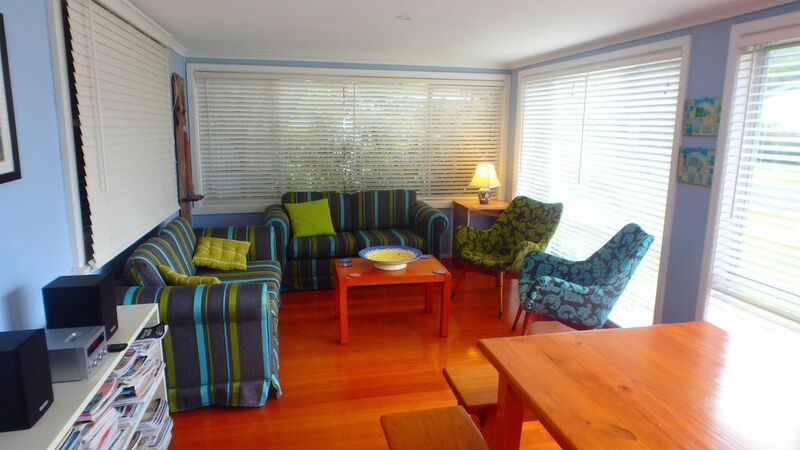 The location of this home is great, only a short 5 minute walk to main shops in Apollo Bay and the beach is even closer. The home had everything we needed, there is no air conditioning, we were there in summer however did not need one. My mum stayed with us and requires the use of a walker, the steps leading into the house are quite high, not very good for someone with a bad hip, however once inside there was plenty of room to help her negotiate her walker. The backyard was great for our large dog (side gate approx 150 cm high). The house has character, with thoughtful finishes and was clean, enabling us to feel comfortable. We would love to return and experience a lovely winters holiday here. What a wonderful, comfortable home away from home! We had the loveliest time! The house provided everything we needed and more. So comfortable & clean. We loved the fire. Secure backyard was great for our dog. Plenty to do with the table tennis & all the puzzles, books, movies etc. Close to town & beach. The kids begged us not to leave. We’ll be back for sure! Comfortable pet friendly holiday home. We found this holiday house to be very comfortable for our beach holiday with the dogs. Very close to beach and shops, both only 5 minute walk. Backyard is securely fenced with a lovely lawn and shady tree. Everything we needed was provided including wood to light the fire on a chilly night. Thanks Joy and Leigh. We had a wonderful time at this amazing house. The location is perfect , close to shops and beach but also in a quiet street. The house provides everything anyone could possibly need! Clean,cosy and space for everyone! Our 4 legged family members had an amazing holiday too !Thanks so much for having us!